Sleek and stylish, the Loft Series of Burners from White Mountain Hearth features a contemporary look but still provides that warm and cozy feel and ambiance that comes with sitting by the fire. To heat your space with this ANSI certified vent-free, simply install it in any certified vent-free. 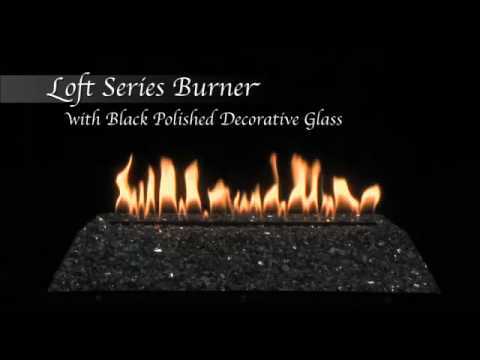 This set features decorative crushed glass in a polished black. The Loft burner provides 26,000 BTUs of supplemental heating power to quickly and efficiently heat your space. A damper clamp is included with all Loft burners. For safety, an Oxygen Depletion System will shut down the burner if the oxygen levels become unsafe. All gas log sets from Empire Comfort Systems are designed and tested to ANSI standards. Proudly made in the USA. This set features a basic on/off standing safety pilot valve that is operated by on/off switch or the included remote control.